Times are difficult for many retailers. Conspicuously not among them, however, is Fast Retailing Co., which posted both record sales of ¥685 billion and operating profit of ¥108.6 billion for the business year that ended in August. 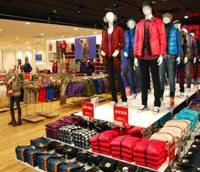 Out of all its subsidiaries, Fast’s main breadwinner is the Uniqlo chain of reasonably priced casual clothing. Having become a dominant clothier in Japan, Fast Retailing now has the world in its sights, hoping Uniqlo can become the global No. 1. How did Uniqlo build up so much popularity? Uniqlo has become a household name in Japan in the past decade, but its origins date back many years earlier. In 1949, Hitoshi Yanai, father of Fast Retailing President Tadashi Yanai, the Uniqlo head, founded Men’s Shop Ogori Shoji in Yamaguchi Prefecture and sold men’s clothing. Tadashi Yanai assumed the company’s helm in 1984 and opened the first Uniqlo store that year in Hiroshima Prefecture. In the first few years, the company expanded the number of Uniqlo stores mainly in western Japan and aggressively marketed the clothing brand. Yanai changed the name of the company from Ogori Shoji to Fast Retailing in 1991. 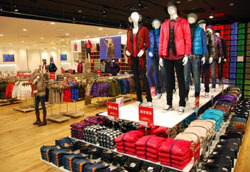 A turning point came in 1998 when Uniqlo pushed fleece wear for ¥1,900 , selling 2 million units. The fleece boom continued. In 1999 Uniqlo sold 8.5 million outfits and 2000 saw it sell 26 million as the chain’s popularity soared. Before the fleece boom, Uniqlo’s sales were already on an upward trajectory. The firm logged ¥83 billion in annual sales in fiscal 1998, ¥111 billion in fiscal 1999, reflecting a 33.6 percent increase, then doubled to ¥229 billion in fiscal 2000 and hit ¥418 billion the year after that. Uniqlo’s domestic outlets numbered 770 as of the end of October, compared with 357 at the end of August 1999. Why were Uniqlo’s fleece products so successful? Consumers considered the goods high quality and reasonably priced. Kotaro Kawashima, a journalist and business consultant who wrote “Naze Uniqlo Dakega Urerunoka?” (“Why Is Only Uniqlo Selling Well?”), said the company also pursued strategic sales. For instance, fleece clothing initially was not regarded as fashionable. But Kawashima said the chain succeeded in making it trendy. In 1998, Uniqlo took the bold step of opening a major shop in fashion central for Tokyo’s young — the Harajuku district. The Harajuku store’s first floor was dedicated to offering a rainbow of fleece clothing. This got shoppers’ attention, and they came to consider such clothing hip. Uniqlo’s fleece outfits came in 15 colors in 1998. By 2000, the lineup came in 51 shades. How does the chain produce its clothing? Uniqlo manages the process from production to distribution, following what it calls the SPA business model, or specialty store retailer of private label apparel. Industry observers say the SPA model has allowed the chain to grow. A key part of the strategy is to place large lot orders for each item. This results in a dramatic reduction in procurement prices, Kawashima said. Once the production mold is set, there is little difference in the labor time or effort to produce 5,000 or 100,000 units of each item. Thus, massive lot orders can keep operating costs low, Kawashima explained. Also, most Uniqlo clothing products are made overseas where labor is cheap, including in China and Cambodia. Kawashima noted that other companies sold fleece outfits during the 1999 boom but could not discount them below ¥3,900, while Uniqlo items sold for ¥1,900, about 25 percent of which was profit. In addition, the firm sends experienced technicians and engineers from Japan to its overseas manufacturing facilities to improve the quality of the products as well as the production lines. What recent strategies are being pursued? After the fleece boom tapered off, Uniqlo saw sales decline for two consecutive fiscal years starting in 2002. “There weren’t products that could cover (the decline in fleece sales). It was like a recoil from the rapid growth,” said Shun Tanaka, chief analyst at SMBC Friend Research Center. Not to be undone, Uniqlo churned out more hit products, including the Bra Top (a top with sewn-in bra cups), tapered jeans and Heat Tech thermal inner wear, Tanaka said. The company is strongly pushing Heat Tech, and Yanai hopes his stores manage to sell 50 million units this fiscal year. Fast Retailing also strengthened the Uniqlo business through effective mergers with and acquisitions of other fashion retailers. Has Uniqlo’s growth influenced Japan’s apparel industry? Yes. Because of its success, consumers are paying more attention to balancing quality with price, Tanaka of SMBC Friend Research Center said. “It has become harder to sell expensive products that used to be purchased for their brand image,” he said. Is Fast Retailing looking to grow bigger? Yanai surprised the public when he declared several years ago that the company would aim to make ¥1 trillion in annual sales and ¥150 billion in pretax profit in fiscal 2010. In September, Yanai made a bolder remark that he wanted to make his company the world’s largest apparel retailer, logging ¥5 trillion in annual sales by 2020. Yanai stressed the importance of having a global marketing strategy. “We will become the runaway apparel leader in Japan and bring Uniqlo to the world,” Yanai said during a news conference Sept. 2. The company hopes to log ¥3 trillion in sales overseas, Yanai said, breaking that down to ¥1 trillion from China, ¥1 trillion from the U.S and Europe, and ¥1 trillion from other regions. Can Uniqlo really expect to grow overseas? Uniqlo opened its first overseas store in London in 2001. Although the company has struggled to promote the brand in some countries, it has been gradually expanding its global share. According to its fiscal 2009 financial report, Uniqlo made about ¥37.7 billion in overseas sales through 92 outlets in seven countries. As of the end of October, Uniqlo had 110 overseas stores. The company opened three global flagship stores, in New York City, London and Paris. The flagship store in Paris, which opened last month, attracted a huge crowd on opening day. “I think there is good potential (for Uniqlo). It has built its own position, and the brand image seems to be receiving more recognition,” Tanaka said, adding that markets in Asia, particularly China and South Korea, probably have more potential for growth for Uniqlo than other overseas markets.